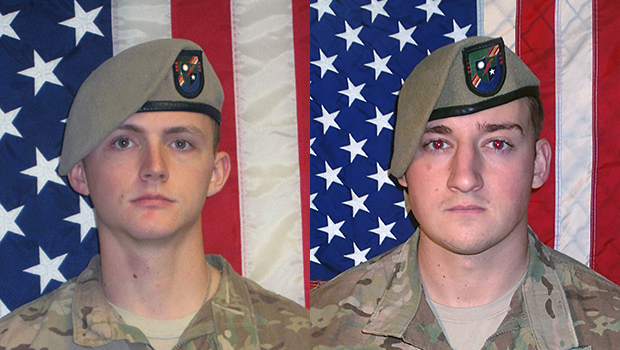 The Defense Department on Friday released the names of two Army Rangers who died during a raid on a compound in Afghanistan on Thursday. The target of the raid was Abdul Hasid, the emir of ISIS Khorasan, the group's Afghan branch. Hasid was believed to be hiding in the compound close to the border between Afghanistan and Pakistan. The raid was conducted by 50 Army Rangers and 40 Afghan commandos on Thursday, the Pentagon said. The mission was considered high-risk and Gen. John Nicholson, commander of coalition forces in Afghanistan, personally approved the raid. The suspicion of friendly fire first arose during a debriefing of the Rangers after the raid, Martin reports. A review of surveillance footage further added to the suspicion, and the suspected friendly fire appeared to come from the American troops, not the Afghan commandos. The military says it is investigating the incident and will interview the service members involved. Autopsies will be performed on the two bodies after they are returned to Dover Air Force Base.